The people closest to me know that I can sometimes get on my soapbox and go on a rant. We all have our moments that get us fired up, and for me, it can be some of the hottest or latest issues and topics in the nutrition world that just “rot my socks” so to speak. The topics that get me most fired up, you wonder? Well, you may be surprised to hear that many common perceptions about gas/bloating, gluten and food sensitivities are often times misinformed and these are some of the hardest areas for me to just shut up and be quiet. The month of March has focused on common food fights you may face and for this post I would like to highlight "digestive woes" within the context of the aforementioned topics. I will do so by addressing some of the most common questions that I receive within my office walls. Are you ready? Here we go! What is gas? Where does it come from? Gas is normal. In fact, the average person can pass gas 12-25 times a day. This is obviously not ideal, especially if you are sitting in a conference room with colleagues all day! Rarely however is it a sign of a serious disease. There is no way to completely eradicate your body from producing gas but we can try to cut down on how much gas is produced and lessen the discomfort of bloating. Did you know that 90% of the gas in your body is from swallowed air? This gas leaves in one of two ways – through the top end (burping) or the bottom end (flatulence). The rest of the gas in our body is produced by bacteria that live inside our large intestine. These bacteria love to feed on undigested carbohydrates and fibre from the foods we eat. The by-product of this process is that they produce hydrogen and methane gases which our bodies naturally expel. Aha! So it IS carbs (i.e. gluten) that make us gassy?! No, no, no. Pay close attention. Carbohydrates, my friends, is NOT synonymous with gluten! Technically, any foods that contain carbohydrates can cause gas. This includes fruits, vegetables, grains, dairy, dried beans, peas, lentils, sugary foods, sugar alcohols etc. Foods that have the types of carbohydrates in them that we as humans cannot fully break down will produce more gas … enter beans, cabbage, Brussels sprouts, cauliflower etc. (Yes, smile with me, you know what I’m talking about!) So do not draw the battle lines pre-emptively with gluten, please! In fact, there is a well-researched group of carbohydrates that are known to rapidly ferment, for some people, inside the intestines and produce gas. These carbohydrate-containing foods are called FODMAPs or Fermentable Oligosaccarides, Disaccarides, Monosaccarides, and Polyols. (Pull that one out at your next dinner party to impress!) This process is illustrated quite nicely in this video by Monash University in Australia who were the founders of the low FODMAP diet for sufferers of Irritable Bowel Syndrome (IBS). What kinds of carbohydrate-containing foods are on this list and known to produce gas or other unpleasant symptoms? Healthy and nutritious un-suspecting foods like apples, grapefruit, peaches, watermelon, avocadoes, asparagus, mushrooms, garlic, onions, dried fruit, honey, hummus, beans, barley, rye bread, kefir, yogurt, cashews, pistachios and on and on and on. Long story short, your issue may not lie solely with gluten. The only way to figure out which foods are causing your digestive woes is to do an elimination diet (or low FODMAP diet) and then reintroduce foods, one at a time, in order to determine which foods are, and are not, well-tolerated. FYI - The low FODMAP diet is a temporary diet used to figure out an individuals’ own unique foods sensitivities but is not meant to be a long-term diet. Be sure to get the help of a dietitian who is qualified in this area before you begin. Elimination diets are a lot of work. Isn’t there a food sensitivity test will tell me what food(s) are causing my digestive problem(s)? If you’re the kind of person that likes to flush cold hard cash down the toilet then feel free to get a food sensitivity test! (Can you sense the harsh sarcasm?) These tests will cost you about $400-$700 and are based on ZERO research. In fact, the Canadian Society of Allergy and Clinical Immunology (CSACI) was so concerned about the increased marketing of food-specific allergy testing using immunoglobulin G (IgG) that they issued a formal statement about how crappy these tests are, which aligned with similar statements made by their counterparts from the U.S. and Europe. I had a client once who came to see me after he unnecessarily eliminated all the "reaction foods" from the results of this invalid test, lost 40 pounds because he could only drink water and eat air and ended up on sick leave from work until he sought appropriate help, started to eat again and was able to regain some weight. This is the kinda stuff keeps me up at night! I don’t have time for an elimination diet and I work too hard to waste my money. However, I would bet my life on the fact that I am sensitive to gluten since I feel 100% better when I don’t eat it. So, I am just going to avoid it, most of the time, except on the weekends when I want to drink beer! Although that may seem ideal, I would also have to frown upon that plan. If you are highly suspicious of gluten, then I would recommend you speak with your doctor and ask for a blood screening test for celiac disease (which is an immune reaction to eating gluten and VERY different from a sensitivity). If the test is positive, then you would proceed with an intestinal biopsy to confirm, which is the definitive means of diagnosing celiac disease. However, for the test to produce accurate results, you need to currently be eating gluten-containing foods (i.e. the equivalent of 4 slices of bread daily for 12 weeks prior to the blood test). So, don’t take out gluten before you get tested. PLEASE! Get the test. Proper diagnosis is SO important. If you have celiac disease you need to take every last crumb of gluten out of your diet, buy a new toaster, pour your beer down the drain, and give up your premium membership to Bulk Barn as your days for risky cross-contamination are over! If you celiac test results come back negative but you still suspect that gluten is causing you issues, then you can try to reduce your gluten intake (as we do know that there are some people who have what we call non-celiac gluten-sensitivity), but do not do it beforehand. Isn’t a gluten-free diet healthier then one that contains gluten? No. It can be equally as healthy as a gluten-containing diet but that doesn’t come without work. The gluten-free diet is challenging to follow (just ask any person with celiac disease), it is complicated and expensive. It can lack vitamins, minerals, fibre and may be higher in fat and sugar, as the manufacturers of processed gluten-free foods need to add something to help with texture and flavour when there is not gluten there to help. Need more convincing? A recent (2017) study out of Harvard University collected data from three separate large studies (which included close to 200,000 people) and reported that individuals who had the least amount of gluten in their diet, had a significantly higher risk of developing type 2 diabetes. Now, as I have mentioned before, study design is important and this study relied heavily on retrospective data, and therefore, can only show us an inverse relationship between a gluten-free diet and type 2 diabetes and cannot prove that a gluten-free diet causes type 2 diabetes. However, it should help people WITHOUT celiac disease to reconsider limiting their gluten intake with respect to the prevention of type 2 diabetes and potentially other chronic diseases. So, have I convinced you yet that gas is normal, gluten isn't necessarily a villain and that food sensitivity tests are highway robbery? I hope the answer is yes. Gas is normal. Excessive and uncomfortable/painful gas is not. Eat slowly and limit talking during eating. Drink from a glass, not a bottle or can or through a straw. Avoid chewing gum and sucking on hard candy. Avoid sipping on hot fluids as more air is swallowed when hot drinks are sipped. Certain foods containing short-chain carbohydrations (or FODMAPs) can make some of us more gassy than others. IgG food sensitivity tests are a scam. PERIOD. Get tested for celiac disease before you take gluten out of your diet. PLEASE!! Gluten-free diets are not necessarily healthier. They may in fact be LESS healthy! This blog post was adapted from materials found on the DC Nutrition Month website. Practice-based Evidence in Nutrition. Got gas? Find out why and how to control it. 2008. Carr et al. 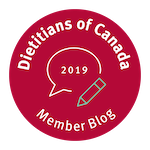 : CSACI Position statement on the testing of food-specific IgG. Allergy, Asthma & Clinical Immunology 2012 8:12.